Author(s): Ezzaldeen Y. Jomma, Ning Bao, School of Public Health, Nantong University, 226019 Nantong, Jiangsu, P.R. China. Shou-Nian Ding. School of Chemistry and Chemical Engineering, Southeast University, Nanjing 211189, P.R. China. 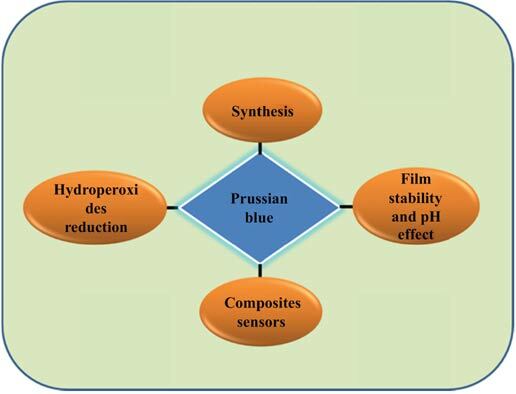 Prussian blue (PB) is one of the most commonly used electrochemical mediators for analytical applications during the last decades. Its redox properties of electro-catalyzing hydrogen peroxide qualify it to be used in construction of various sensors for environmental, clinical and food analysis. In this review, the significant characteristic of PB was extensively discussed. Several methods for synthesizing Prussian blue nanoparticles (PBNPs) were also involved. A comprehensive review was given to the electrochemical sensors based on PB composite modified electrodes to monitor hydrogen peroxide and organic peroxides. Furthermore, both pH effect and stability of PB film in sensing applications were highlighted. Keywords: Hydrogen peroxide, hydroperoxide, prussian blue, modified electrodes, synthesis. Affiliation:School of Public Health, Nantong University, 226019 Nantong, Jiangsu, P.R. China., School of Chemistry and Chemical Engineering, Southeast University, Nanjing 211189, P.R. China. Keywords:Hydrogen peroxide, hydroperoxide, prussian blue, modified electrodes, synthesis. Abstract:Prussian blue (PB) is one of the most commonly used electrochemical mediators for analytical applications during the last decades. Its redox properties of electro-catalyzing hydrogen peroxide qualify it to be used in construction of various sensors for environmental, clinical and food analysis. In this review, the significant characteristic of PB was extensively discussed. Several methods for synthesizing Prussian blue nanoparticles (PBNPs) were also involved. A comprehensive review was given to the electrochemical sensors based on PB composite modified electrodes to monitor hydrogen peroxide and organic peroxides. Furthermore, both pH effect and stability of PB film in sensing applications were highlighted.